The hike begins with an easy trail of concrete stairs which eventually â€˜disappear' and make way for natural ground. 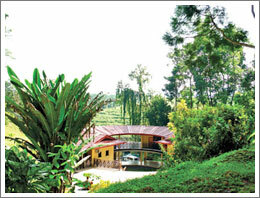 The uphill walk is fairly challenging, particularly for beginners. Watch out for rocks, bulging tree roots and the like. Some parts get steeper and more demanding, but the beautiful natural surroundings make it all worthwhile. 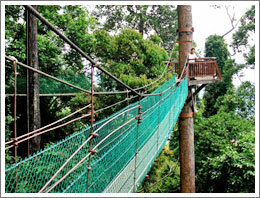 At 231 metres long, it is deemed one of the longest canopy walkways in Sabah. Your â€˜struggle' to the top will be worthwhile once you get a glimpse of the breathtaking view of Tawau from this high up. The stunning scenery spans the town centre, the picturesque coastline and its surrounding areas. 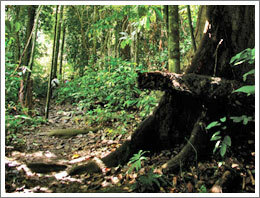 The trek down Bukit Gemok should take a shorter time, but be warned that the trail becomes muddy and slippery during the rainy season, so exercise extra caution. A taxi ride from Tawau town will cost around RM30.00 (one way). It is recommended that you make returns arrangement with your taxi driver. Public transport is not readily available in this area.